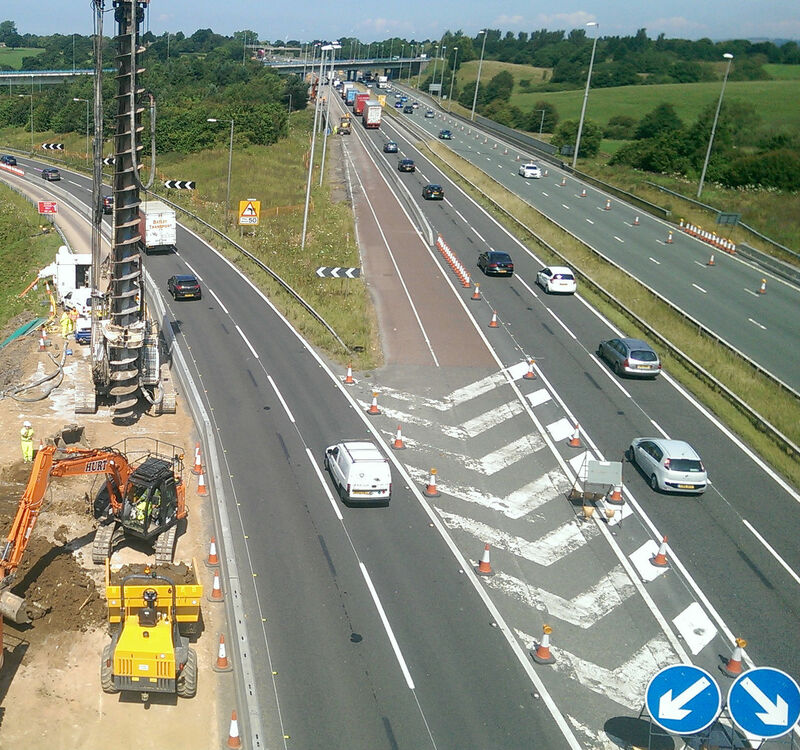 FK Lowry Piling has recently completed Piling Works adjacent to the M6 Motorway in Lancashire. FK Lowry Piling were Sub-Contracted by Carillion to install 1200mm Ø CFA Piles up to 15m deep adjacent to the “Live” M6 Motorway, over a 3 week period. FK Lowry utilised their high-torque Soilmec SR70 to install the CFA Piles that will carry compressive and tension loads for new Motorway Gantries. 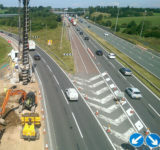 Piles were required on both the Northbound and Southbound Sections of the M6 whilst the Motorway remained “Live” at all times. The Piles were installed to 14m below piling platform level and full length reinforcement cages were installed. The Reinforcement Cages consisted of an upper 16 B40 cage and a lower 16 B32 Cage with a 1,500mm “spliced” connection. Typical sub-soils on site consisted of Made Ground/Fill overlying cohesive Glacial Till followed by granular Glacial Till. The Piles were founded in the underlying granular deposits. 4 No. Static Load Tests were specified on Working Piles and Integrity Testing was carried out throughout. Sacrificial reaction test anchors were carefully positioned to enable value engineering by sharing reaction points between static load tests. Working on a high profile scheme on a small site adjacent to the UK’s busiest Motorway set high demands from the Operations Team.